If you like your flyfishing holidays filled with adventure, in beautiful places where big fish live, with real home-from-home comforts and great food, then a stay at The Patagonian BaseCamp in Chile should definitely be at the top of your list. The journey, culminating in a flight aboard a light aircraft that lands in the middle of nowhere on a strip of road that is closed to motor vehicles during landing and take-off, is an adventure in itself. 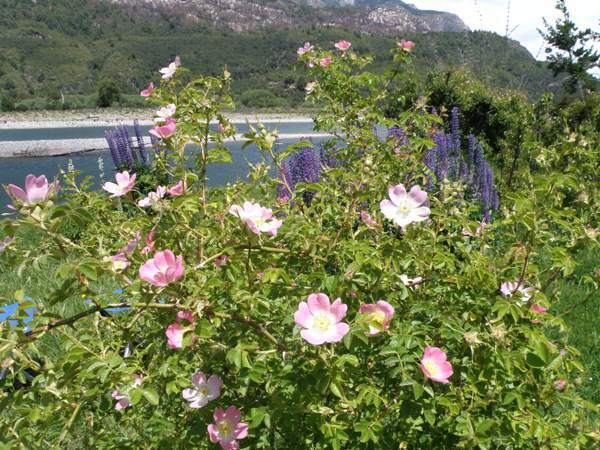 We flew from Heathrow to Santiago via Madrid and then on to Puerto Montt on the west coast of Chile, where we spent one night before flying onto Chaitén, whose 'main' road doubles as an airstrip. From there we continued by road to The Patagonian BaseCamp, which nestles beside the beautiful Palena river. The tiny town of Chaitén was devastated by a volcanic eruption in 2008 but is fighting back, with its new airport expected to be opening soon. New roads are also being built in the area and hard-surfacing of the rough track from the town to The Patagonian BaseCamp is nearing completion and will considerably reduce the time (currently around two hours) taken on the final leg of the journey. 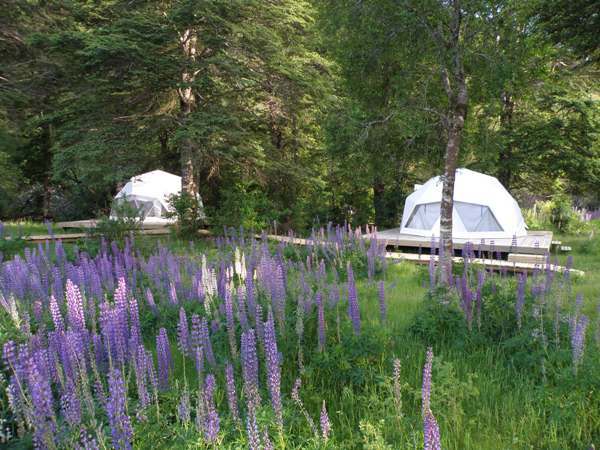 Patagonian BaseCamp, as the name suggests, is much more than a single flyfishing venue. The main lodge house beside the River Palena is only one accommodation option, and there are two camps from which other rivers and other stretches of the Palena can be accessed. This unique concept is the brainchild of the owner of Patagonian BaseCamp, Marcel Sijnesael. Instead of having to pack up your belongings and move on to another lodge in order to fish a different river, the main lodge acts as a base where you retain your room while you go off for one- or two-night stays in the camps and fish different rivers. 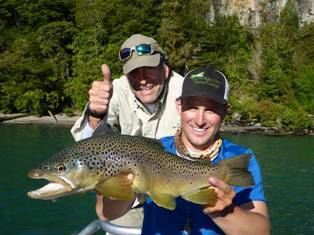 This convenient and very comfortable programme sets Patagonian BaseCamp apart from all the other fishing trips we have made to Patagonia, and it is definitely one we would wish to repeat. The fact that, from the customers' point of view at least, this highly complex operation works so smoothly is a credit to Marcel's management skills and to the dedication of all those who work at the lodge. To us it seemed like a near faultless operation, with meticulous attention shown to the primary concern of safety as well as to our comfort and overall enjoyment of the Patagonian BaseCamp experience. 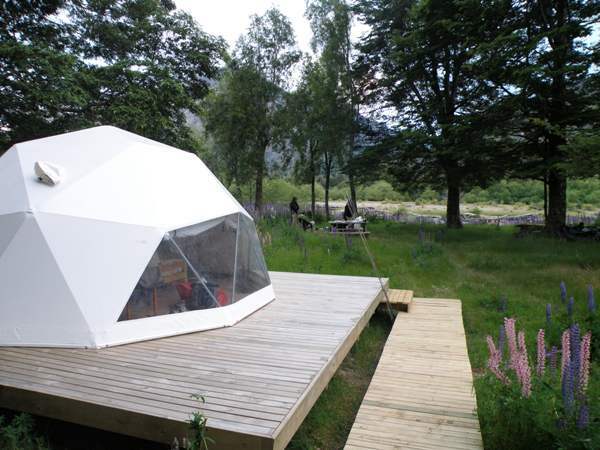 The remote camps are a 'million miles' from a mere tent pitched on a river bank. Palena Camp (where you stay one night) is the more rustic of the two away-from-Basecamp facilities, with Temple Camp (where you stay two nights) having power, hot showers, toilets and a separate lodge for dining and relaxing. Staying at the camps is not compulsory, and a special itinerary is tailor made for each angler on arrival at the BaseCamp. We would, however, strongly recommend including the camps in your programme because the fishing 'floats' from both venues were some of the most spectacular and productive of our stay. 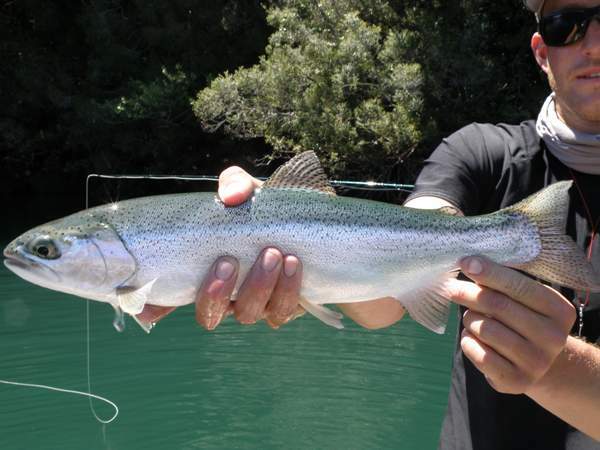 The fishing is predominantly for Rainbow Trout and Brown Trout, and there are plenty of big fish about. The rivers are also home to King (Chinook) Salmon, which were much in evidence although we didn't fish for them. 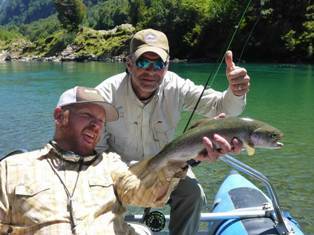 All the fishing is catch and release with barbless hooks, and the care and conservation of fish is high on the agenda of Patagonia BaseCamp. Nearly all the fishing is from boats or rafts, and many of the fishing trips involved thrilling whitewater rafting through some stretches of the rivers to get to the prime fishing locations. 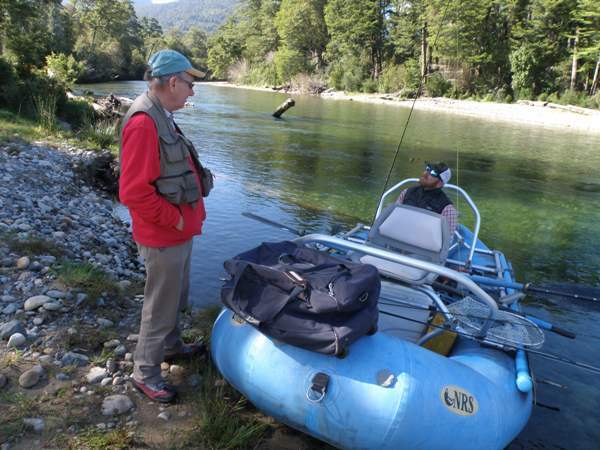 Each boat carries two people, and an experienced fishing guide accompanies each pair. The river fishing techniques comprised a mixture of streamer fishing with large lures, and dry-fly plus dropper tactics. 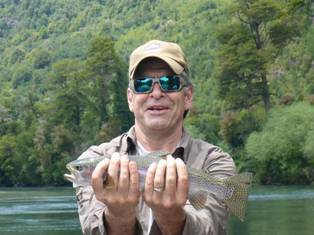 On the warmer sunny days (we were there in December which is springtime in Chile) there were also opportunities for dry fly-only fishing. There are a number of lakes which can also be fished and, if you are lucky enough to have a wind-free sunny day during your stay, the fishing on Lago Rosselot in particular is an experience not to be missed. 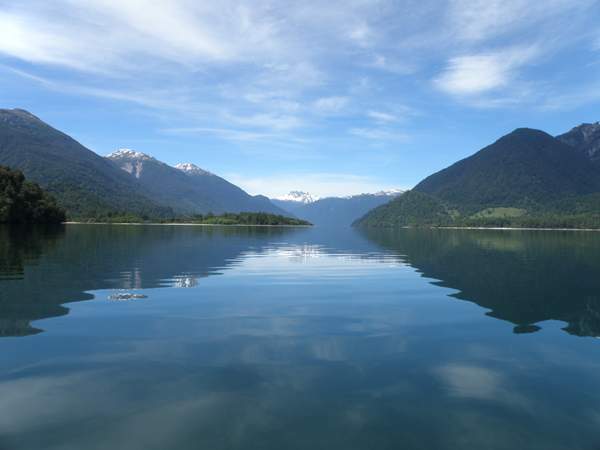 Not only is the location of Lago Rosselot outstandingly beautiful but, on a sunny day, the lake offers superb sight-fishing for large Rainbow Trout that search the foam lines created by wind and currents for food. They rise periodically to take insects (and your fly) on the surface. In the morning we fished the margins of the lake, casting towards the rocky overhangs. Attracting the fish proved difficult initially and 'going bigger' with the fly was the wrong direction. They were feeding on tiny mayflies. We tried a small Comparadun which provoked an immediate reaction. Later in the afternoon we moved out into the middle of the lake and had repeated success with small beetle imitations. The biggest challenge was to work out which way a rising fish was travelling and then casting accurately enough, but without spooking it, so that the fish would 'find' the fly; getting it right resulted in a truly great day of sport. Below: Preparing to set off with guide and white water expert Craig Boyd. 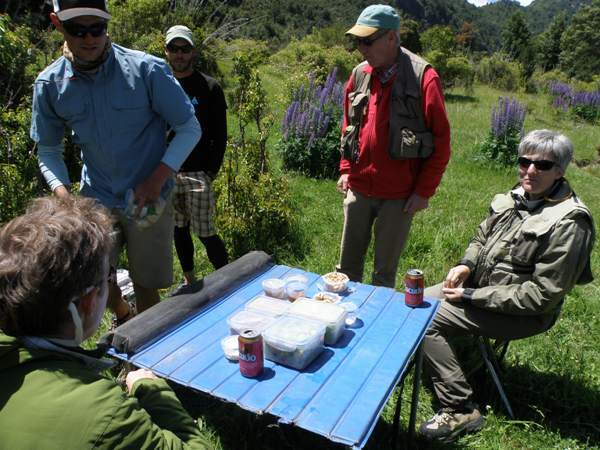 During our 9-day programme we fished the Rio (River) Palena, Rio Claro Solar, Rio Figueroa, Rio Rosselot and Rio Pico as well as spending a day (described above) on Lago (Lake) Rosselot. Our first day was spent floating down and fishing this crystal clear river. As an introduction to both the fishing and the outstanding scenery in the area this river is hard to beat. It has fish in it too - large fish. Tactics included streamer fishing and, as the weather was warm and sunny, plenty of dry fly fishing using large 'rubberlegs' patterns that seemed equally attractive to both the Rainbow and Brown Trout. 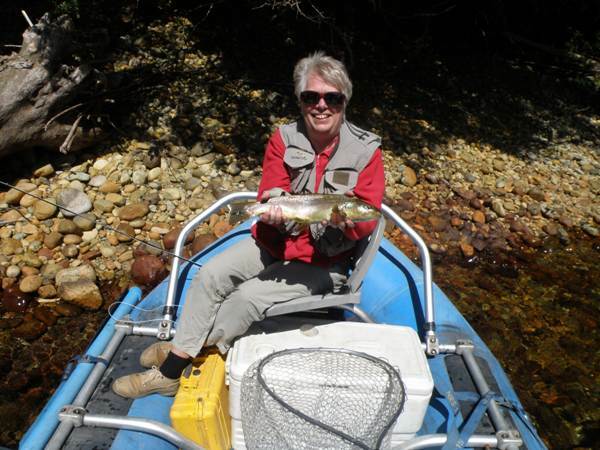 The Rio Claro Solar has trout habitats in abundance. From deep dark holes in between the overhanging bankside vegetation to pebbly margins and calm back waters and eddies (particularly loved by large Brown Trout), the river is a total 'des-res' for trout. The casting (especially on a windy day) can be challenging, but perseverance and the sacrifice of a few flies paid off with considerable numbers of fish being landed by all members of our party who fished the Claro Solar - both the experienced and the new-to-flyfishing. The day ended with a delicious dinner accompanied by excellent Chilean wines at the main BaseCamp lodge. Day two of our fishing programme began with half the party being transported to a float which ended at Palena Camp (for one night) and the other half going direct to Temple Camp (for a two-night stay). We floated down a stretch of the Palena ending up at Palena Camp. As a complete novice camper I viewed the prospect of a night 'under canvas' with some suspicion - especially as Palena Camp has no power and the bright sunny day was followed by a clear and very cold night. I need not have worried. As soon as we arrived, after a very windy but successful day of fishing on the upper Palena, our two guides Hayden Stribley and David assumed the roles of hosts: a camp fire was lit, accommodation (in roomy tents with proper beds and fresh linen) was allocated and, by the time we had dumped our bags, made use of the 'facilities' which included a flush toilet and sink for washing, the wine was open and the nibbles served beside a roaring fire. What followed was as much performance art as cooking! 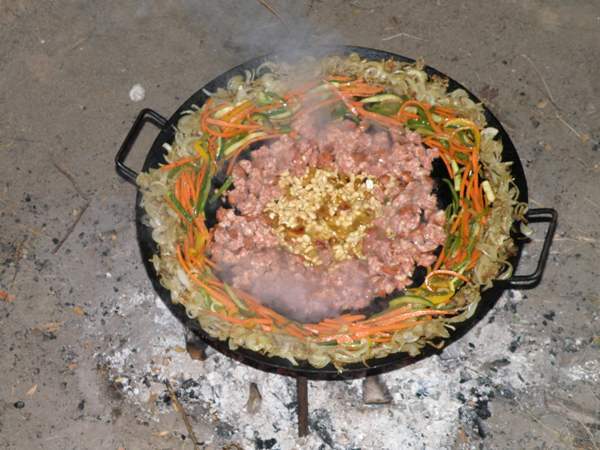 Hayden produced his 'disco' - a large wok-like cooking vessel that balanced securely on three legs immediately above the camp fire. Eat your heart out, Gordon Ramsey - Hayden was just as good at demonstrating and describing the ingredients and cooking process of his 'all in one dish' as any television chef. To describe in detail the ingredients of the meal would be to spoil the fun for future visitors. Suffice it to say that whatever diet you are on it's best to put it on hold for one night! Fishing and fun are the best way to describe the day and evening; there were no complaints about difficulty in getting to sleep! The following day began with coffee and breakfast (again produced by Hayden and David) after which we packed up and put our belongings into the boats before setting off on a long fishing float on the stretch of the Palena below the camp. 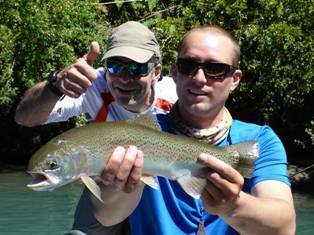 It was a magnificent day of fishing in a huge variety of habitats occupied by some very large Rainbow and Brown Trout. In the afternoon we spent some time concentrating our efforts on a large, sheltered backwater that contained a considerable number of very large fallen tree trunks - ideal accommodation for monster Brown Trout. Because the water was so calm and clear the casting had to be long distance on longer leaders using dry flies - anything else would have immediately hooked-up on the submerged logs. Once a big Brown Trout was hooked, action to land it had to be immediate to prevent the big fish from doing what large Brown Trout do best - plummeting to the depths under the nearest snag and tying your leader and line in as many knots as possible. Although we didn't land all of the fish we hooked there, we more than made up for it in the many other backwaters and eddies encountered during the rest of the day. At 5pm we pulled over and donned extra layers of clothing for the 90 minute jetboat ride through magnificent scenery back to the main Palena BaseCamp lodge, where the Palena Camp party dined in the absence of the Temple Camp party who were embarking on their second night out in the wilderness. This was the hottest and calmest day of our visit, with conditions ideal for fishing on the lake. In the afternoon we had the option of jet boating up the Rio Figueroa to fish, but we both opted for continuing with the lake since we so seldom have an opportunity to fish lakes for truly wild fish. 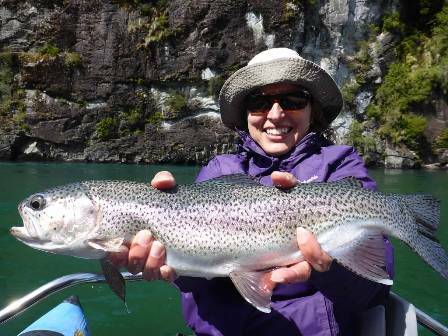 Our party unusually consisted of five lady anglers and two men, and on our fifth day four ladies set out with guides Zachary Otte and Craig Boyd to fish the Rio Rosselot, which flows out of Lake Rosselot and eventually joins the Palena. We fished with a mixture of streamers and dry fly/dropper setups and both methods were excellent. Part of the float consisted of white-water rafting, and we pulled over to don safety clothing and life vests for the rough water. Day six saw us setting off in a two vehicle convoy with boat trailers to Temple Camp for our next 'wilderness' adventure. The drive took some two hours and, after unpacking baggage at the camp, we set off to our put-in point on the Figueroa, which runs from Lago Verde to Lago Rosselot. 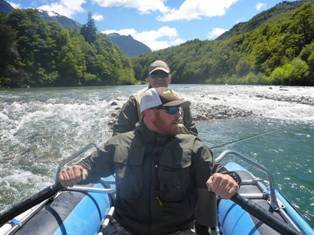 Each pair of anglers fished different sections of the river on the three days (two camp nights) and we all reconvened at the camp in the evenings, travelling back to the BaseCamp lodge on the third evening. Temple Camp is a revelation. There are three 'en-suite' tents for guests and each has a shower (with hot water), a flushing toilet and a sink. There is a separate fully equipped cabin where meals are prepared and served by the guides and the absolutely indispensable Fabian Schilling - not a man of all trades but a master of all trades from carpentry to cooking. The Figueroa is a roaring river with some serious white-water rafting to be undertaken when floating (hopefully upright!) from one prime fishing location to another. The scenic beauty is outstanding ,and part of the float is through a spectacular gorge (immediately below the Pinball whitewater) literally providing calm after the storm. 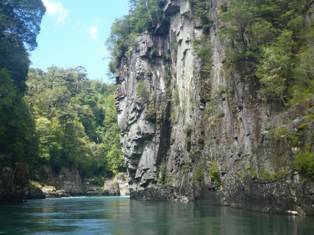 The water in the gorge is deep blue-green and it is easy to see the large Rainbow Trout that live there hugging the sheer rock walls safe in the knowledge that they are not fished for - fishing recommences further downstream. To fish this section would mean missing some of the most spectacular views of the entire trip and would also prevent the guide from having a well-earned rest following the tricky navigation of Pinball. The Rio Figueroa continues the theme of the other rivers - pristine and literally stuffed with Rainbow Trout and Brown Trout. Fishing from a small and often fast-moving boat in pairs is always fraught with difficulties, with many tangles along the way, but every now and then even the novices get the fly in exactly the right spot to land a seriously big fish in this wild and wonderful river. 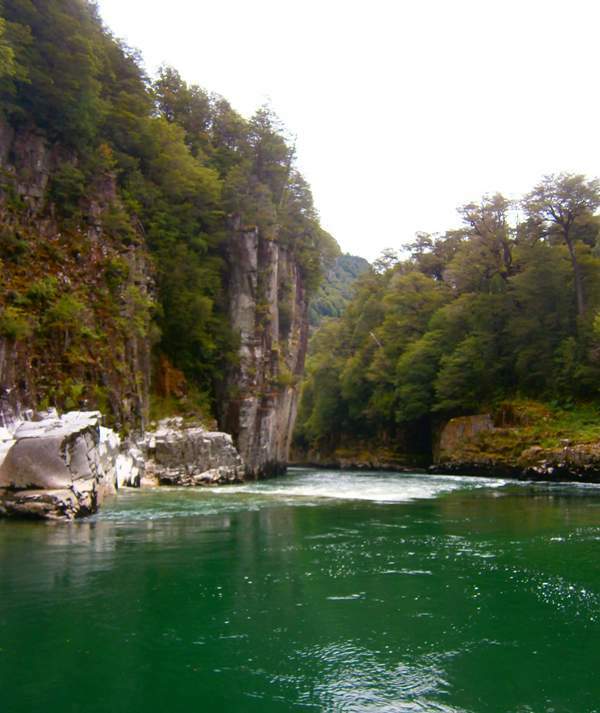 This was definitely our favourite of the many rivers fished during our stay at Patagonian BaseCamp. Our put-in was at a benign spot about a sixty-minute drive from the main lodge. In many ways the Rio Pico is the river most reminiscent of rivers we have fished in Europe, with the major difference being the number and size of the fish which we began catching from the moment we set off from the bank. The weather was kind and the breezes light. Our guide for the day, Craig Boyd, pulled the boat onto the bank and offered Pat the challenge of casting into a tree-lined side water of the river, where a very large Rainbow Trout was reputed to live- he refused the fly, but his deputy obliged. I simply sat and enjoyed the view. Our final day of fishing was the only day when it rained. The weather forecast was dire, but most of us opted for a final cast before our epic journeys home the following day. I floated the Palena with Craig Boyd, and the weather was merciful during the morning and held up fine until mid afternoon when it poured. The fishing was different - a rather slower affair than on previous days, but where else would I catch four wild Rainbow Trout in excess of 20 inches in one day? In summary, this was the most enjoyable fishing trip we have had to date. Given the remoteness of the area and the logistics involved the organisation was excellent. 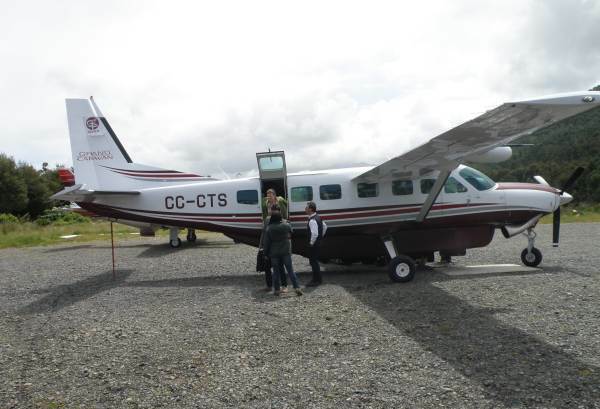 The charter flight from Puerto Montt to Chaitén and back, accommodation, food, wine and guiding are all included in the price making the experience outstandingly good value for money. 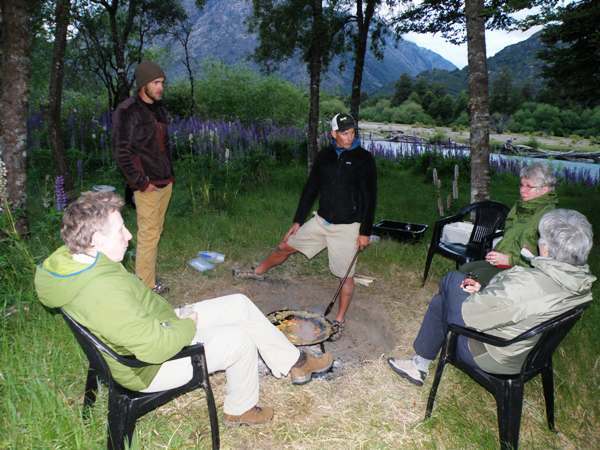 We strongly recommend this trip which was arranged by Roxtons with Patagonian BaseCamp. 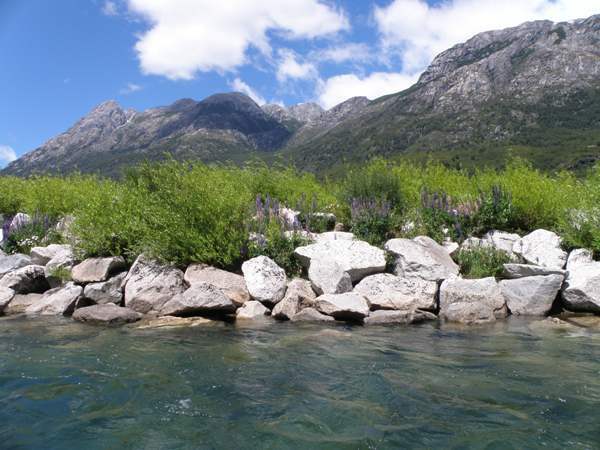 Rods - the weather on the western slops of the Andes, even in high summer, is very unpredictable and can be wet, cold and windy, requiring a range of fishing tactics. For dry-fly fishing in breezy conditions a 9ft #6 rod is ideal. For streamer fishing, often utilising a sink-tip line, a 9ft #7 rod is more appropriate. Matching floating lines and sink tips for both rod weights are recommended. Flies - a range of large 'Fat Albert' and 'Gypsy King' dry flies are ideal and, if the rivers are high, large (size 8 long-shank) weighted stonefly nymphs as droppers are invaluable. 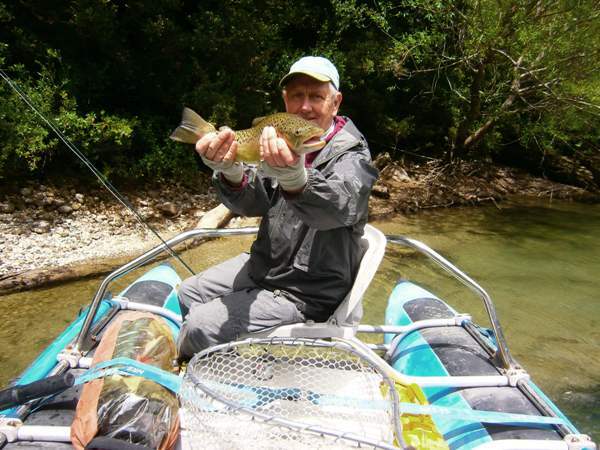 For streamer fishing colourful 'minnow' imitations were the most successful. The guides generally provide suitable flies for fishing, and this service should be taken into consideration when tipping. Clothing and safety equipment - chest waders are a must for wet and windy days, but wading boots are provided at the lodge in order to prevent imported infections entering the river systems. Even in summer the weather can turn cold and wet, and so a range of warm waterproof clothing that can be 'layered' is absolutely essential. For nights in the camps warm fleeces and jackets are often required. Life vests are carried in all the boats at all times, and helmets are provided for whitewater stretches of the river. Peaked caps help with spotting fish in sunny conditions, keep the water out of your eyes when it rains, and offer excellent protection from the sun on bright days. 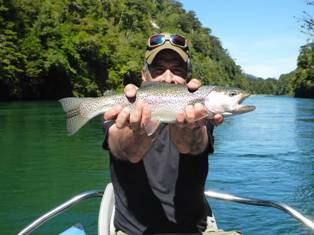 Guides and Tipping - all the guides employed at Patagonian BaseCamp are top-class fishermen and casters with extensive knowledge of the rivers and fishing in the area. New guides go through a training programme with the more experienced guides before they are allowed to accompany clients on their own. Tipping at a rate of US dollars 50 - 60 per person per day is acceptable, and the cash should be presented to the owner on the day of departure. The tips are shared between the guides and the other staff employed at the lodge. Other considerations - even on dull days the power of the sun in this part of the southern hemisphere is strong. Sun cream with minimum factor 40 protection is essential and should be used at all times. Should you forget a vital piece of equipment or break or lose rods during your stay, the BaseCamp has a fully equipped tackle room and both the owner and the guides generously provide replacements for use during your stay. 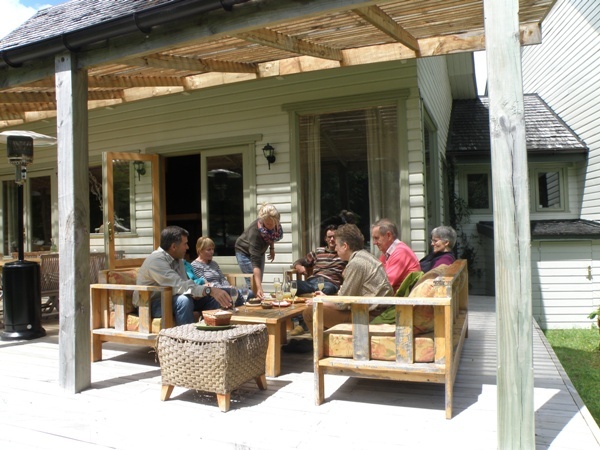 The main lodge accommodation is excellent with a range of ensuite bedrooms. There is a lovely dining room/lounge area with a massive central fireplace. Outside there is a large patio with comfortable chairs and a barbeque and oven. The food and logistics of the lodge are managed by Kelly and overseen by Marcel's wife Carolina. Kelly, who looks after the guides as well as the clients, displays unfailing patience and good humour. 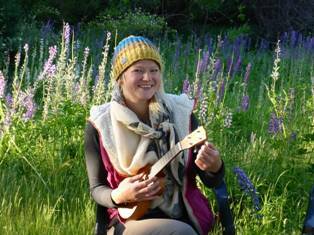 She is also an excellent musician and singer and may be persuaded to sing and play the guitar after dinner. The cooking is first class and meals are eaten around a large table that accommodates all the guests. Drinks and snacks are provided every evening on return from fishing, and wine is served each night with dinner. 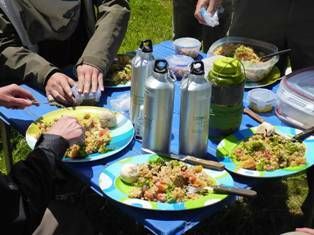 The kitchen also provides all the picnic lunches, which are carried on the boats and served up by the guides. A range of soft drinks are provided for lunch and during the day but, in the interests of safety on the rivers; alcoholic drinks are not. 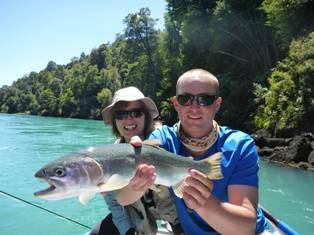 Patagonian BaseCamp is predominantly a fishing operation, but some activities can be arranged for non-fishing visitors. The lodge is an excellent place to relax, and there is a hot tub and a sauna. 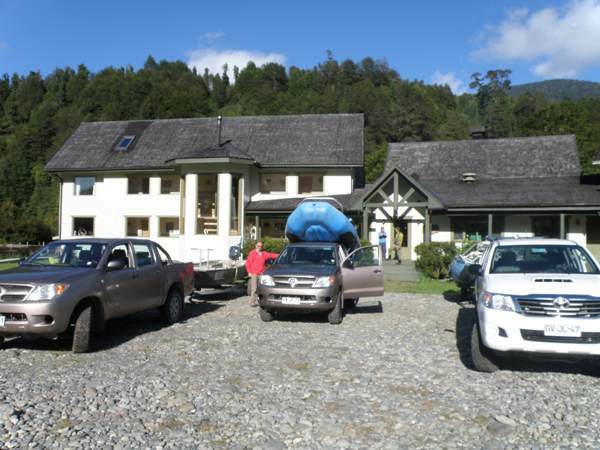 Horse riding is available and visits to the two nearest towns of La Junta and Chaitén can be arranged. The wildlife, and in particular opportunities for birdwatching, in this vast and unspoilt area is unparalleled, with many unusual plants and animals to be discovered. If your partner is a lover of the natural world, he or she should be encouraged to participate in some of the fishing floats in order to enjoy the scenic beauty and the wildlife of the area. 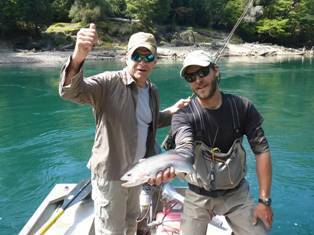 As a result of the acquisition of a lodge and fishing rights just over the border in Argentina, from 2015 onwards there will be a new programme to incorporate visits to both lodges.